For uniform sands & gravels a set of standard graphs is created for a spatial or transport volumetric concentration Cvs of 17.5% and a particle diameter of d=1 mm. For other concentrations and particle diameters the graphs/curves may differ, especially the volumetric transport concentration Cvt graphs/curves. 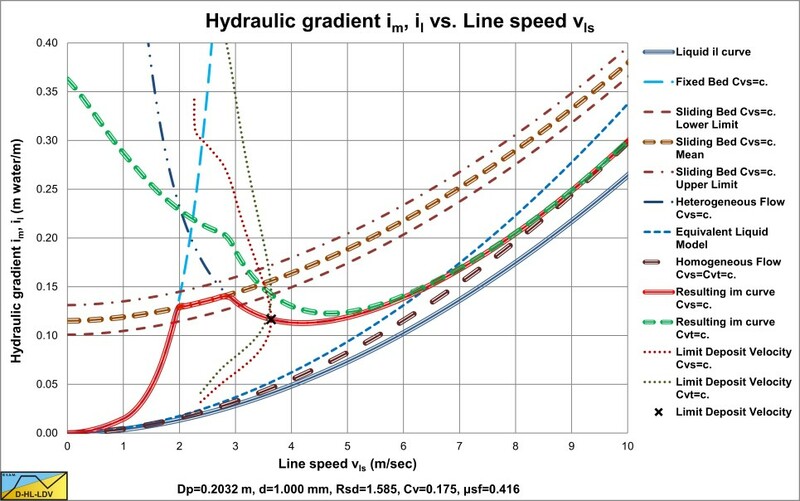 The DHLLDV Framework is derived for uniform sands and gravels and constant spatial volumetric concentration. 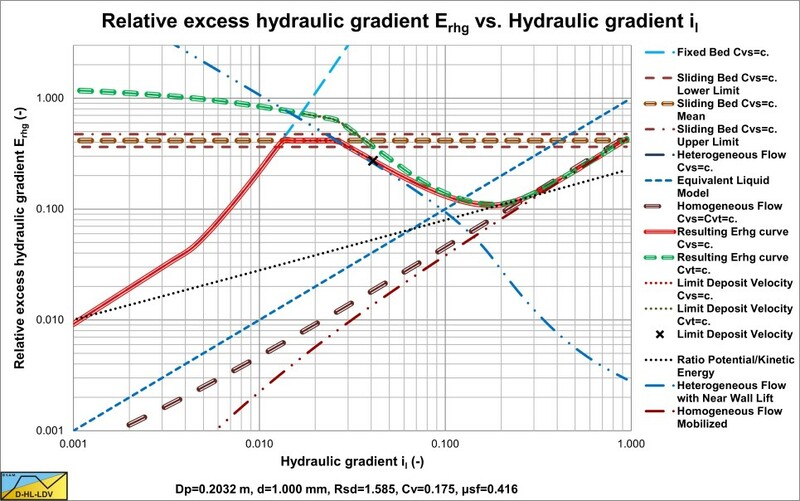 Multiplying the hydraulic gradient with a factor 1000 gives the mixture pressure loss for a ΔL=100 m pipe with water as the carrier liquid. 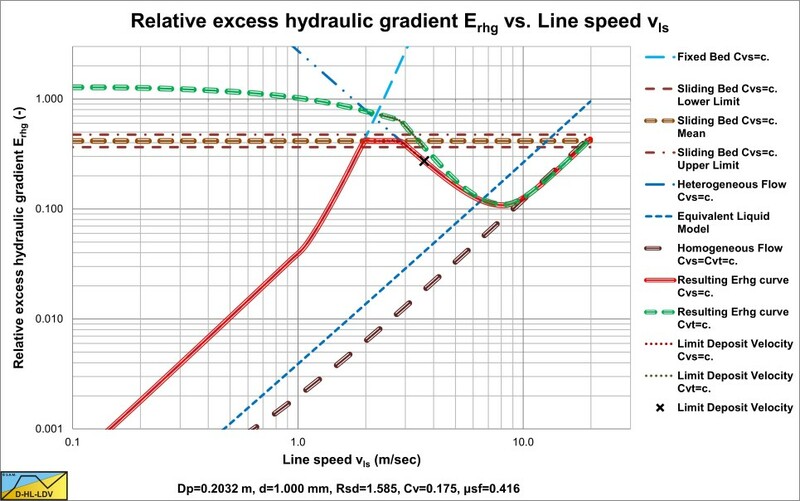 The Relative Excess Hydraulic Gradient Erhg is the solids effect (ρm-ρl) divided by the relative submerged density Rsd and the volumetric concentration either spatial Cvs or delivered Cvt. Durand & Condolios introduced a set of coordinates Ψ and Φ, based on using double logarithmic paper for processing experimental data into power curves. The ordinate and abscissa are given in the graph. Most of their experiments were carried out in pipes with a diameter of Dp=0.1524 m (6 inch). 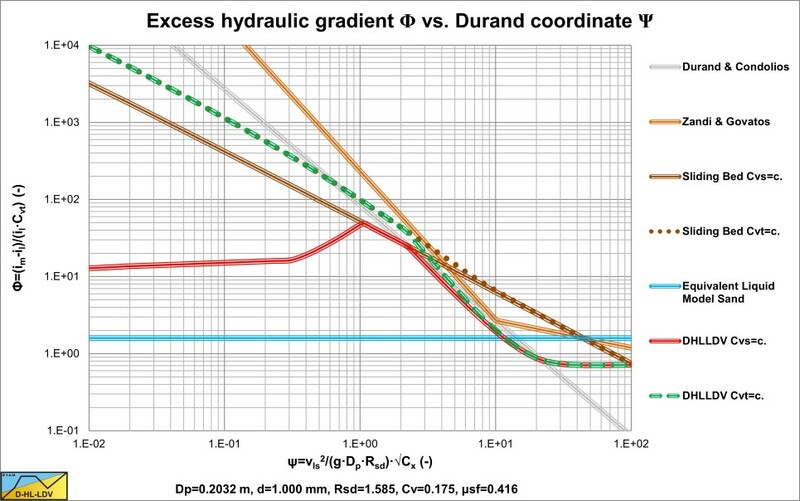 For larger diameter pipes the Durand & Condolios equation (grey solid line) over-estimates the pressure losses. For smaller pipe diameters it under-estimates the pressure losses. 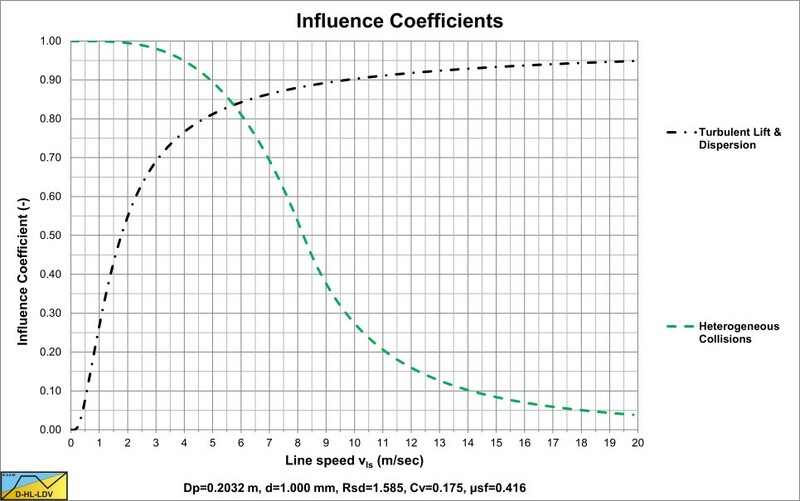 The slip factor or holdup function determines the relation between the constant spatial volumetric concentration curves and the constant transport volumetric concentration curves. 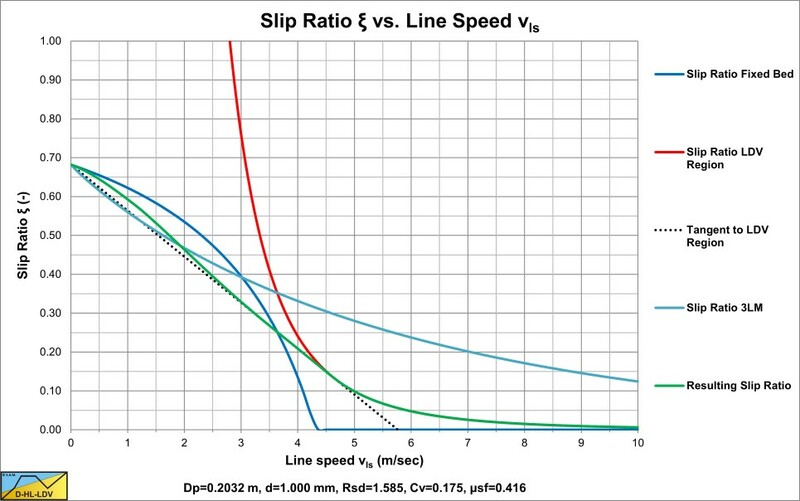 The slip factor is determined based on the Limit Deposit Velocity. The bed height is determined based on the LDV and the slip factor. The spatial volumetric concentration Cvs curve is based on constant delivered concentration Cvt and the slip ratio ξ curve. The mobilization factors show the collapse of the collisions in the heterogeneous flow regime and the mobilization of particles following the turbulent eddies in the homogeneous flow regime. 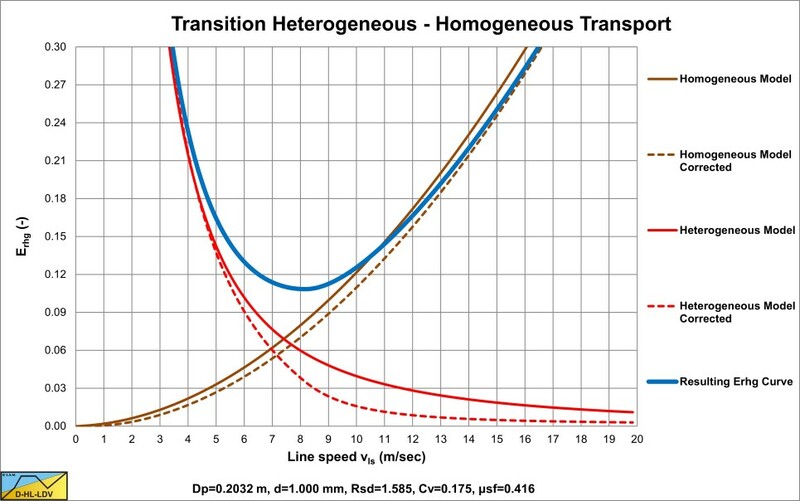 The mobilized heterogeneous flow regime curve and mobilized homogeneous flow regime curve are added, resulting in a transition curve from the heterogeneous to the homogeneous flow regime. The resulting slip ratio ξ curve is constructed based on 3 regions. The fixed or sliding bed region (the dark blue line for the fixed bed region and the light blue line for a sliding bed including sheet flow, 3LM), the region around the Limit Deposit Velocity (the red line) and the region of line speeds above the LDV (heterogeneous and homogeneous flow regimes). The solid green line give the resulting slip ratio. 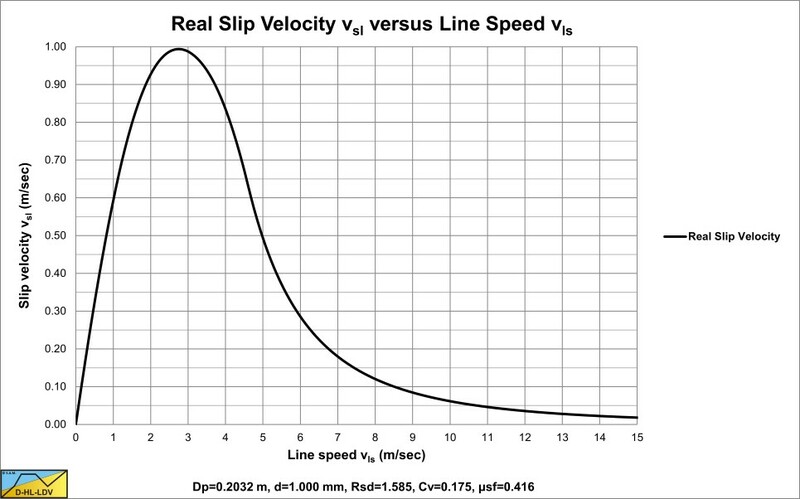 The actual slip velocity is determined by multiplying the slip ratio curve with the line speed.